I have recently created and started doing 4 full-body workouts that I alternate between. After a month and a half, it occurred to me that I could post them on a fitness forum and see if others more experienced than me at fitness noticed any bad choices I may have made, either with specific exercises or my workout plans in general, or any mistakes that I may be making that I don't know about. ExRx is the fitness site I've been frequenting the most, so I thought to try this forum, which I've seen that is also quite active. I'll post below the details regarding my starting fitness level, goals, and the specific workouts. If anyone has any advice or suggestions to offer, they are more than welcome. I am 24 years old, and the most consistent form of exercise I've ever had was a year of semi-professional ballroom dancing I did in my last year of secondary school. Throughout high school and my university studies I've started workouts of simple full-body routines at least 3 times, done at home for the health benefit and a general starting goal of raising endurance and strength, and at most they lasted close to a month before dropping them because of varying circumstances. I have never been overweight and have never been in need to lose weight, nor have I ever had any serious medical conditions. Currently, at the beginning, my goals are to get my strength and endurance off the floor. In the long term, my goals are to build functional strength. Once I've reached a level I deem acceptable, I will switch to building my running endurance, but that will be a separate issue. I am not looking to lose fat mass or add muscle mass outside of what comes with strength gains. I work out at home, and my equipment consists of a two adjustable dumbbells with 1kg, 2kg and 3kg disks, the bars weighing 2 kg each, a wall mounted pull-up bar, an exercise mat and my own body weight. 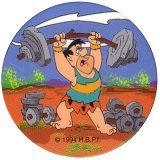 I've found that one should increase weights gradually by 5-10% at a time, but increasing weight on my dumbbells is tricky, since I can only increase in 2 kg increments each dumbbell, or 4.4 pounds. I would normally set my goal for all exercises with weights for 12 reps, but to mediate the large increments I try to reach 15 before adding to the dumbbells' weight. I would gladly buy fixed weight dumbbells, but I currently don't have the means to. I created 4 full-body workouts loosely based on the P90X program, taking from it the idea of changing workouts to maintain variety for my own enjoyment of the workouts, and not for the notion of "muscle confusion" which I haven't read anything on. I also followed various other resources on full-body workouts and creating your own workout. I work out Monday, Wednesday and Friday evenings, alternating between workouts in pairs every month, and within pairs with every workout: first month workout 1 - workout 2 - workout 1 etc., next month workout 3 - workout 4 - workout 3 and so on. I chose the exercises from both P90X and the eXrX database. I do all weighted exercises for 12-15 reps with maximum weight, and all body-weight exercises for as many reps as I can, with a focus on maintaining proper form throughout all of them. Depending on the body-weight exercise, when I reach either 30 or 50 reps I will modify it to increase difficulty or change it with something else. Having said that, because in the past I've had issues with too much muscle soreness all at once which then required long periods of rest, this time I took the precaution of beginning to work out slowly, increasing intensity steadily over the first two weeks. I was centered more on feeling the "heat" than the "burn". Before a workout I did 10 minutes of warmup until recently, and now I do 5 minutes because I can warm up more easily. I took 2 minutes brakes between exercises, lowered to 1:30 and now 1:00, and looking to get to no breaks between exercises, apart from how long it takes me to change disks on the dumbbells. After a workout I do 2 minutes of cooldown followed by a full-body stretching routine, holding each stretch for 20-30 seconds. First, twice I've had slight to medium joints pain, particularly wrists and in the hips. As far as I've learned this indicates bad form, most probably at the last reps in my case, and I've been paying a lot more attention to this. Second, I'm improving at a faster pace than I anticipated, and I am steadily increasing exercise intensity. I was planning on going through the workouts for 4 months before doing split workouts for muscle groups, but now I'll reevaluate if at the two month mark I should split my workouts in lower body and upper body to allow for more recovery time. Is there a standard way to evaluate this? Lastly, today was the first time that I started feeling light-headed and slightly nauseous during a workout, and I stopped the workout completely after two thirds to recover. I'm going to look intro it to see what the most common causes are for this happening during a workout, but if anyone reading this has any thoughts you're welcome to share them. I haven't mentioned anything about my diet because I've been cooking for myself for a long time, and I have more than enough experience to look after my diet properly. I have meals at set times 5 times a day and have never had trouble choosing what and how much to eat. No sugary drinks or chips or the like, rarely wanted such things growing up and even more rarely now. I don't smoke and I only drink alcohol in a few social situations, which even then amounts to a single beer mostly because my body isn't used to alcohol. Honestly, I would drop all this P90x stuff you've been doing. You need to go to back to the basic barbell lifts. I recommend doing some research on gyms in your area and joining one. It doesn't need to be fancy; just look for an inexpensive gym with at least one or two squat racks/power racks, dumbells, and some basic machines such as leg press and leg curls. If you're still in college, use the school's gym; or you could try and find a "rec center" in your area. Not sure if they have those in Europe though. From your choice of diction such as "university studies" I would assume somewhere in the U.K.
Anyways, I recommend you take a look at this post that I made yesterday, which I believe to be the most effective way for a natural trainee to gain size and strength. It sounds to me that you're ready to start on step #3. Research stronglifts, follow the program, train hard, eat alot, and recover properly. You will gain size and strength. Oh yeah...and eat alot. In my opinion, 127 pounds is not a healthy weight for a 24 year old male. I recommend you eat at least 3000 calories a day. Thank you for the advice Jclem. It is unclear from your reply why I need to change my workout to barbell lifts. Having said that, going to a gym is not an option for me. If your workout suggestion is somehow based on a difference of speed in gaining strength, though I don't know if this would be the case, I should mention that I do not have a main priority in achieving the fastest results possible. That's not to say that I have no interest in reaching my goals, but as I have already mentioned, I would much rather stick to a program that is more motivating for me than one that I feel is too monotonous. Additionally, I also mentioned that I have no interest in specifically increasing muscle size. I actually have never understood this aside from personal esthetic preference. Lastly, I have a BMI of 19.3, which as far as I know is within a healthy range. I maintain a constant weight with my diet, and have slightly altered it now that I've started workouts. I would only further alter my diet if I notice any unusual loss or gain of weight or lack of energy unexplainable otherwise, or if I read or hear any relevant or researched information regarding the subject. Dirk101 wrote: Lastly, I have a BMI of 19.3, which as far as I know is within a healthy range. Any reputable strength coach will tell you that BMI is meaningless. It's a broken scale based off of simple, basic data. In that case, I have no standard to check my weight against. My regular medical tests show no issues, and I feel that I am in good health as far as I am able to evaluate this. I understand that your experience says otherwise and I appreciate your telling me this, but unfortunately I can only take it as an opinion. Dirk101 wrote: In that case, I have no standard to check my weight against. Body-fat Percentage is a better standard for determining your overall health, as it takes into account the ratio between lean muscle mass and body fat. Again, it's still not optimal, as it doesn't take into account other factors, but it's generally considered a better standard than BMI. Dirk101 wrote: unfortunately I can only take it as an opinion. The problem is that there are flaws with just about every body fat testing method. That because studies are build on a house of cards. The formula for this "Gold Standard" is based on the dissection of a select few cadavers. Not normal healthy individuals, which slightly flaws the research. The foundation of good research is based on obtaining information on a large population. That minimizes the error factor. Since only a select few cadavers were used it the study, that does NOT afford a reliable study. BMI is a joke. It based on a weight to height ratio. At 127 lbs at 5'8" it not wonder that Dirk has a low BMI number. Dirk most like has a low body fat percentage. Dirk most likely have very little muscle mass. Certainly, dancers want to be "Light on their feet" but 127 is a bit low. At this point, any type of training Dirk does will have a positive effect. I find it a little odd that you would refer to me in the third person. However, doing a year of ballroom dancing when I was 13 doesn't qualify me as a dancer, and I'm not so sure about your estimate of me having very little muscle mass. In the past summers I worked on a construction site for a house my parents were building, and I've never had any problems with carrying around buckets full of sand, breaking bricks with a sledgehammer and digging moats 20m long. And I can understand your point of view that neither BMI or body fat tests are reliable, but would you have an alternative for determining a healthy weight? Dirk101 wrote: I find it a little odd that you would refer to me in the third person. That's how Kenny Croxdale rolls. Even if you had no fat at all (which is impossible), your BMI is so low that your muscle mass would still be considered low. You may be strong but have very little muscle mass. Dirk101 wrote: And now I know. In that case, is low muscle mass indicative of anything? Meaning, does it matter by itself, or is it interpreted relative to other factors? When you're young it doesn't mean much. When you get older, more muscle gives you a reserve. Muscle normally diminishes with disuse and once past 30, most people start losing muscle. If you have little to start with, and you don't take steps to correct it, frailty is the result. Frail people are subject to all manner or situations that can limit the quality of life and even shorten life. As added information to Stuward's point above: taking steps to increase muscle mass after 30; definitely achievable! I've lost fat and added muscle every year since I turned 30 and I've gotten stronger every year (41 now). And I do it for the very reason he gives: to build a reserve that will serve me later into life. for the original poster: 127, even at 0% body fat (if even possible) would indicate to Kenny (and me) that you have low muscle mass. At 5'8" anything under 150lbs is going to be low muscle mass (and that would be at the paper-thin skin level of a 1-2% body fat). I wouldn't suggest that anybody put as much muscle mass on as I have, but for me it was easier to transfer my weight from fat to muscle than to lose the weight.